We first heard about the Enham Trust through a topiary commission (see photo). 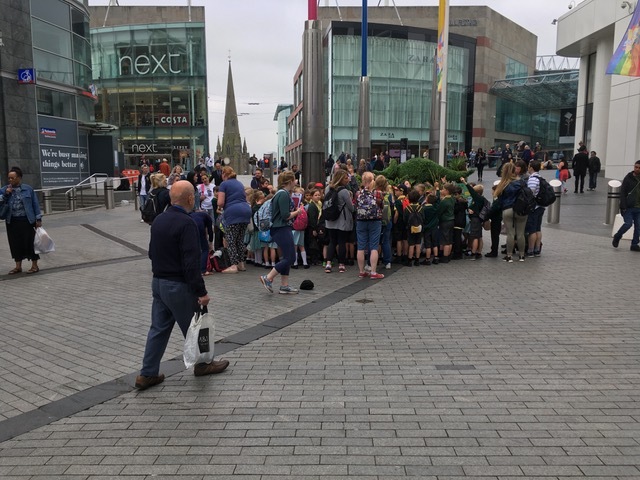 As we got to understand more about them and the wonderful work they do we realised there was no way we could charge them for the project – we simply had to make it a donation! This case study is a great opportunity to bring a fantastic charity to the attention of our other clients and potential customers so they can think about donating too. Over almost 100 years the Trust has facilitated opportunities for hundreds of thousands of disabled, elderly and vulnerable people to live the lives they choose, as independently as possible. The range of assistance offered is phenomenal from personal care (including help with personal hygiene such as bathing and showering, medications and food and drink preparation) to social support (such as shopping trips, domestic care, social activities, welfare checks and financial management and administration). Based in Hampshire but with a much wider reach the Trust’s full care model enables them to provide a ‘wrap around service’ that is personalised and tailored to individuals. Without the Trust’s know-how and support the lives of many people would be much the poorer physically and emotionally. This Christmas and beyond if you’re looking for a deserving charity to support you should look no further that the Enham Trust. Following our recent commissions for Disney to celebrate Mickey’s 90th more work has followed including this witty installation for Disney via the PR company 2Heads. To our wonderful delivery guys that carefully packaged and expertly delivered Mickey to our expectant customer. “Many thanks for what you produced, they met the brief perfectly and added that little extra to a successful event." As previous case studies have shown, Agrumi’s client base is extending and now incorporates the US. After the success of other commissions there, we got a call from the Disneyland Resort in California. 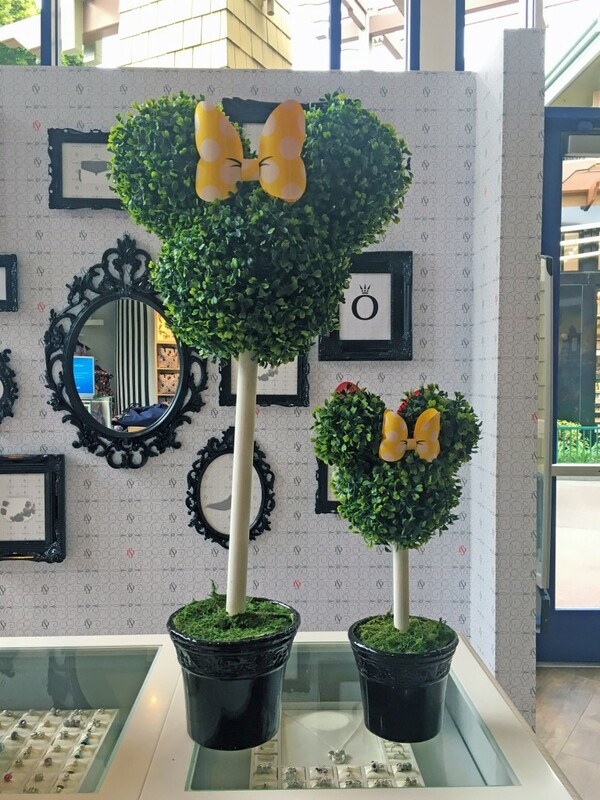 The idea was to make various Mickey and Minnie Mouse items in artificial box topiary for display in shops and at other merchandising outlets. 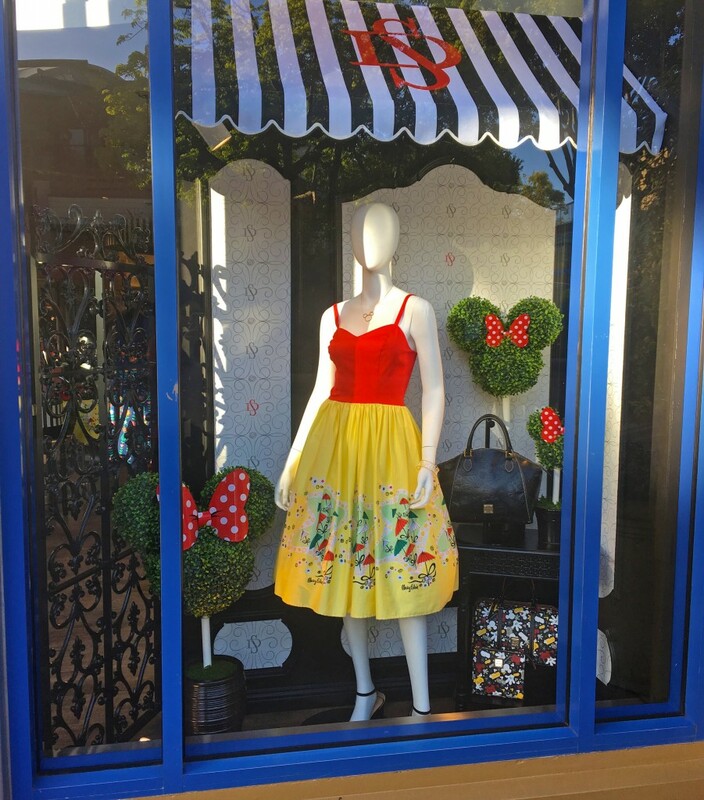 We were only too pleased to help and worked closely with the Disney team to design and make a variety of items that would perfectly encapsulate the spirit of the Mouse and the company’s fun ethos. “Thank you so much for everything your team did for us and with such short notice and lead time. We really appreciate it and it was a pleasure working with you”. 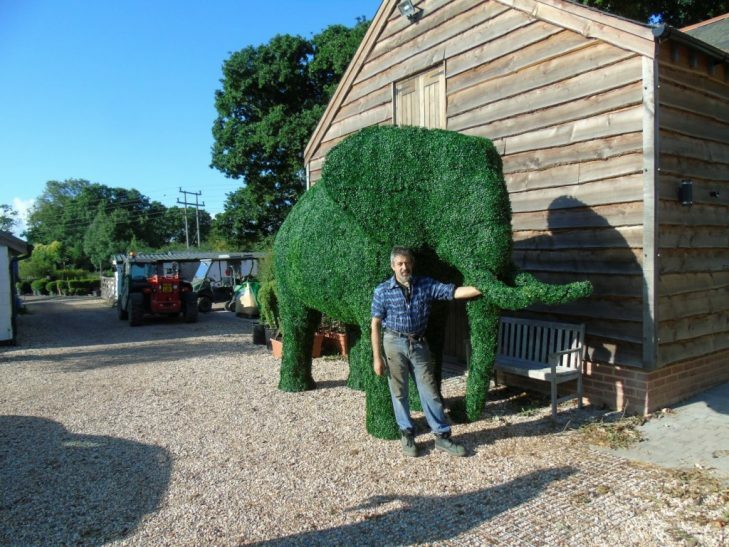 If you run a shop or amusement park then you might also want some topiary sculptures. Contact us today for a free quote! Project Ink is an event management and design consultancy with a rota of high profile clients looking to enhance and promote their profile, services and image. Working on a project with Kuoni, the luxury travel company famous for their safari holidays, Project Ink commissioned us to fabricate a 2.5m high, 2.4m long and 1.4m wide elephant in artificial grass. This big beast was to be the focal point for a Kuoni sponsored event at BBC ‘Countryfile Live’ that took place at beautiful Blenheim Palace in Oxfordshire in August. Pictured here with Luigi, Agrumi’s Head topiarist, our elephant is safari ready! Over 4 gloriously sunny days at the event our elephant wowed the public and presenters alike and gave Kuoni fabulous publicity for their expertly curated holiday packages. The reaction on social media was glowing – as these posts show. 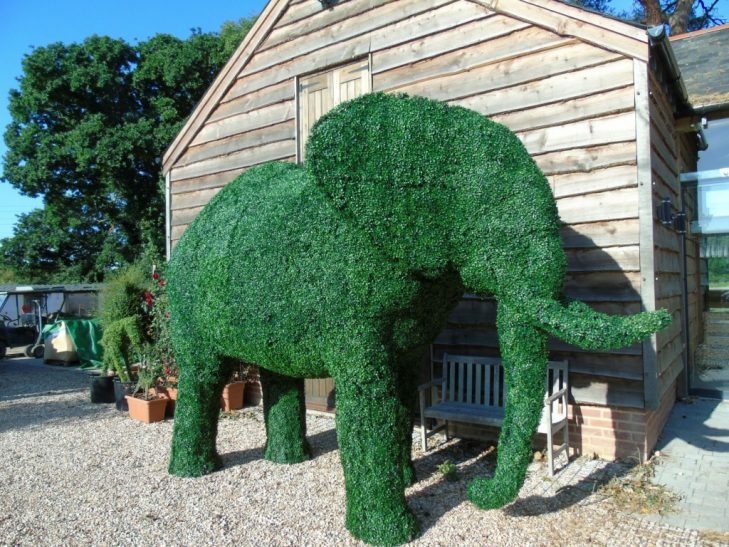 If you need a topiary elephant then contact us today! We’d be delighted to help you! Quantcast is a company on a mission to help brands grow in the AI era. They are in the business of creating algorithms or ‘systems of intelligence’ for the online ‘marketing ecosystem’ so their clients can make smarter, faster and more relevant contact with their customers. Quantcast recently launched ‘Q’ – the world’s largest AI-driven audience behaviour platform for the open Internet. Agrumi was commissioned to help with the UK PR and built this massive 150cm tall ‘Q’. 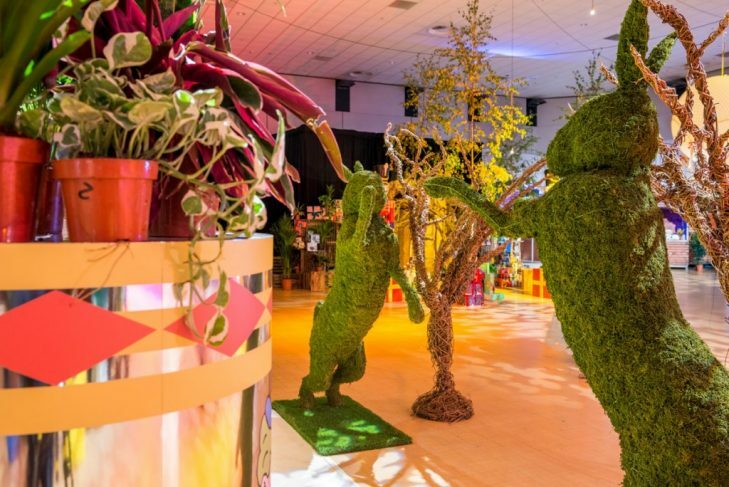 The result is pretty impressive and eye-catching and shows how Agrumi topiary can be used to enhance and reinforce PR messages. 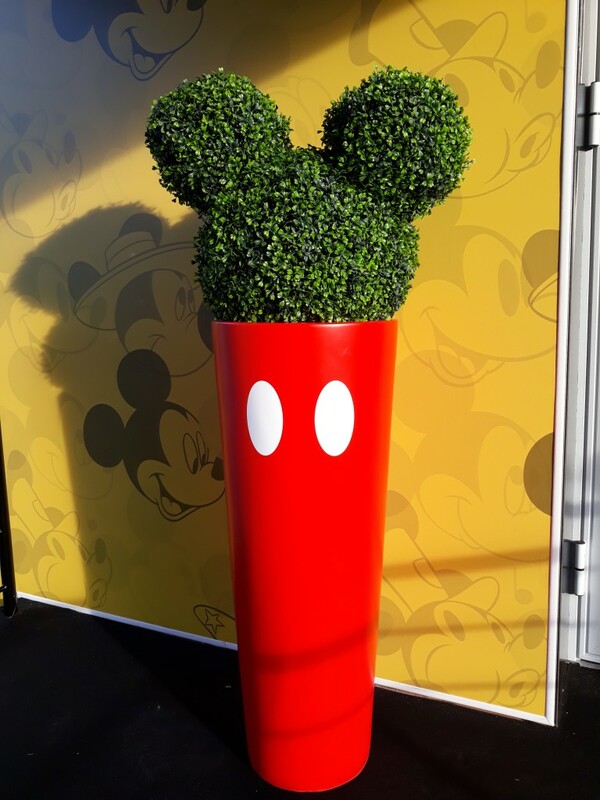 Want to see your company logo in topiary form? Get in touch for a free estimate! Dippy, the Natural History Museum’s iconic Diplodocus cast has been touring the UK on a natural history adventure. He’s been visiting some of this country’s incredible natural history collections and will be at the Birmingham Museum and Art Gallery until 9 September 2018. A few months ago Retail Birmingham – which promotes and supports businesses in the city centre – got in touch. Dippy’s forthcoming visit provided an ideal opportunity for some dinosaur-related PR to promote their fantastic local shops and restaurants. 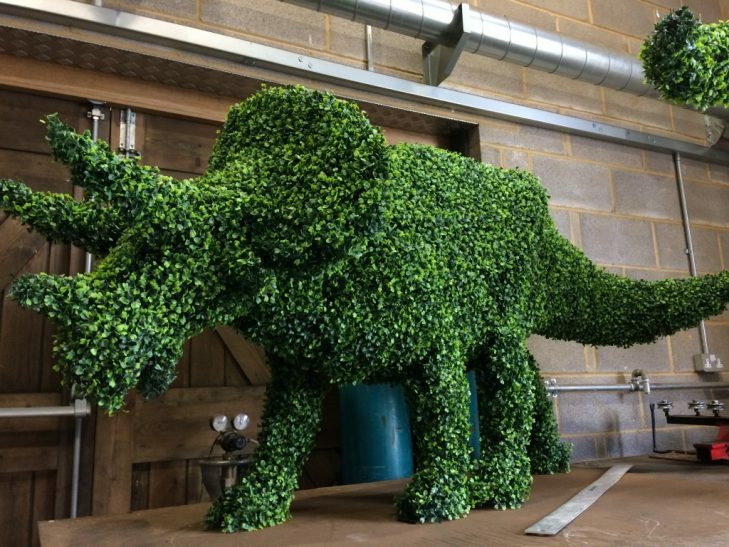 We were commissioned to create five 2m x 1m topiary animals to be displayed in bespoke planters sourced and planted by the local parks team. 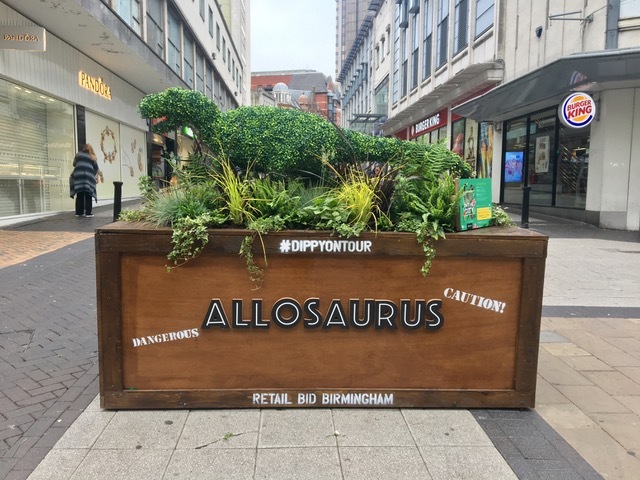 The installations would be exhibited in key central locations and provide focal points of interest for the museum, Dippy’s tour and Birmingham’s commercial sector. Using the Natural History Museum’s own ‘top 5’ list of their visitors’ favourite dinosaurs we made a Stegosaurus, Tyrannosauras, Diplodicus, Coelophysis and Triceratops. 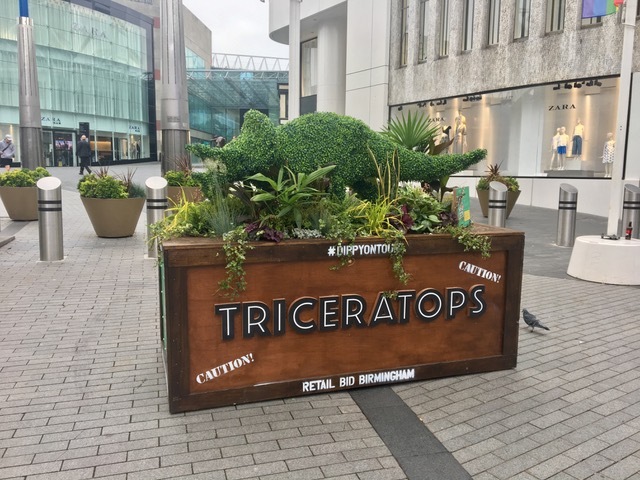 Retail Birmingham told us that the pieces needed to be weather and vandal-proof as well as fire retardant. Artificial boxwood is an ideal choice for this situation and the product we use is both lifelike and robust. 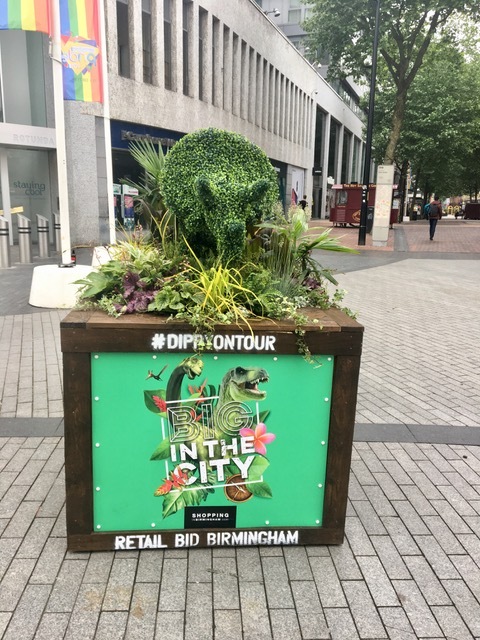 The photos speak for themselves and the public reaction was so positive that a ‘Retail Birmingham’ immediately ordered an extra T-Rex and Stegosaurus. Shortly afterwards three more animals were commissioned – an Allosaurus, Velociraptor and Brachiosaurus. 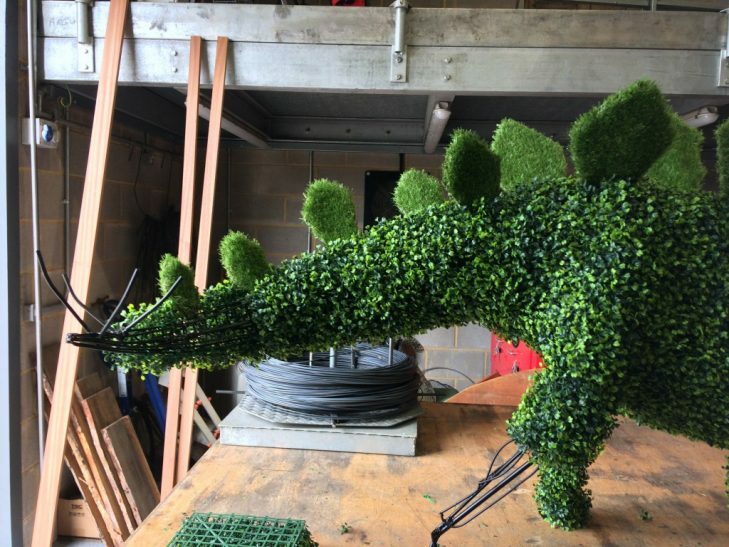 If you’re looking for topiary dinosaurs or need something to spruce up your high street then contact us today! Lush makes cosmetics by hand from natural ingredients. None of its products are tested on animals and the company is rightly proud of this claim – which it advertises through its fighting hares logo. Focusing on the hares for a media event, Lush came to us to ensure that their logo was larger than life and eye-catching enough to take centre stage with journalists. We created the animals’ outlines expertly as usual using our tried and tested frame fabrication methods and the resulting skeletons were covered in moss for ease of transport, handling, care and longevity. Lush now has an ecologically friendly version of its logo that it can use again and again at events to promote the company and its ethos about the welfare on animals. 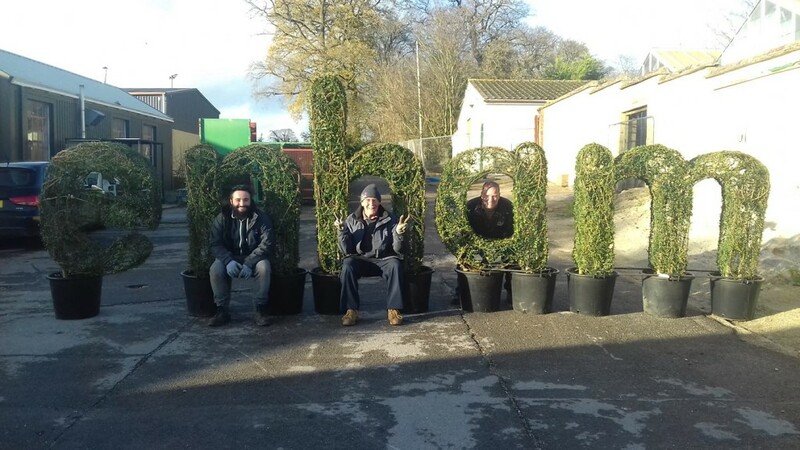 If you’re interested in some topiary hares or would like to see your company logo recreated in topiary then get in touch with us! The 2017 London Frieze Art Fair was a huge success and Agrumi helped one exhibitor gain a coveted Focus Stand Prize. Various Small Fires (VSF) is a small Los Angeles-based gallery that acts for a number of artists of international standing, At Frieze this year the gallery chose to showcase a work by Helen Mayer Harrison and Newton Harrison (collectively known as ‘The Harrisons’). The Harrisons live in Santa Cruz, California and pioneered the Ecological Art Movement back in the 70s. The movement promotes climate change solutions through art and their Survival Piece V Part II: Lemon Orchard Fragment is an early work dating from 1972. 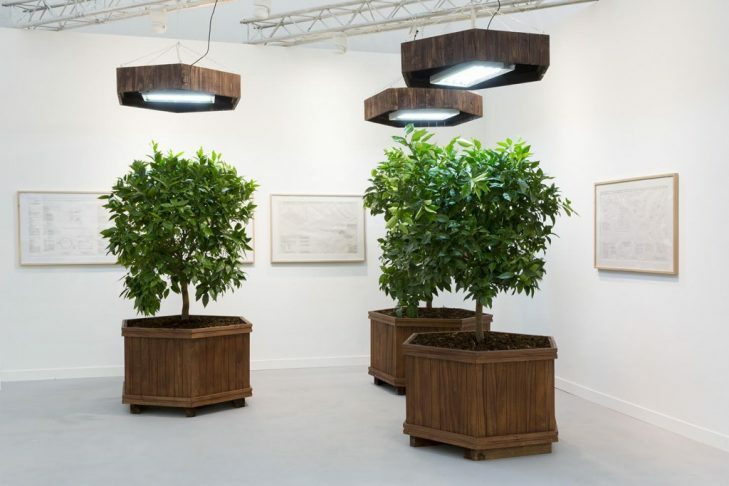 This installation features lemon trees growing under photosynthetic lights and was originally intended to have dual meaning. Firstly, it acted as a critique of human kind’s influence on the planet’s ecosystems and secondly, it was a practical experiment for the indoor cultivation of fruit in a post-agricultural future. VSF chose to partner with Agrumi to re-create Survival Piece V Part II at Frieze in October. We sourced and planted Meyer lemon trees (a particularly hardy citrus breed) in specially constructed tubs that were then co-located under photosynthetic lights. The look of the whole installation exactly replicated the appearance of Survival Piece V Part II as it had originally appeared over 40 years ago – although on a smaller scale. The installation was completed with surviving drawings and other ephemera from the 1972 original and visitors were again able to walk among the trees as they had done before. 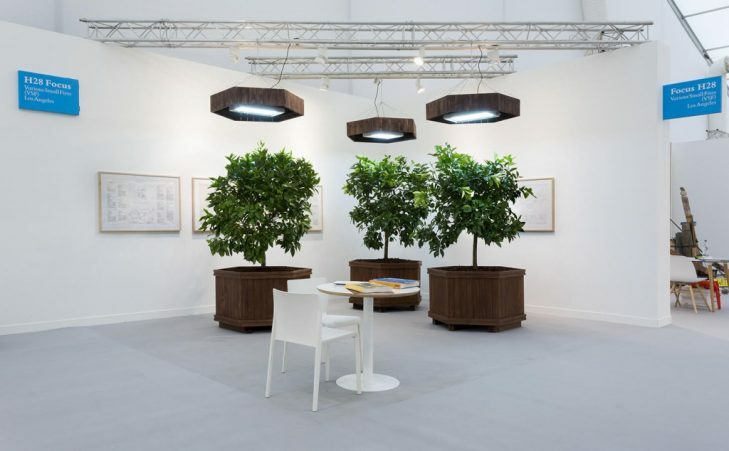 The ‘portable orchard’ caught the eye of the Frieze judges (Richard Parry Director of Glasgow International, Christopher Lew Curator of the Whitney Museum and Hanne Mugaas Director of the Kunsthalle, Stavanger) and won the Focus Stand Prize. This coup for VSF and Agrumi was doubly rewarding. Not only did it recognize the hard work that went in to bringing the installation to life again, it also allowed us to promote a serious ecological message. Following their sojourn at frieze the Meyer lemon trees have been replanted in an orchard. If you need something green on your trade stand then get in touch! … that ‘The Night Gardener’ is a brilliant book. 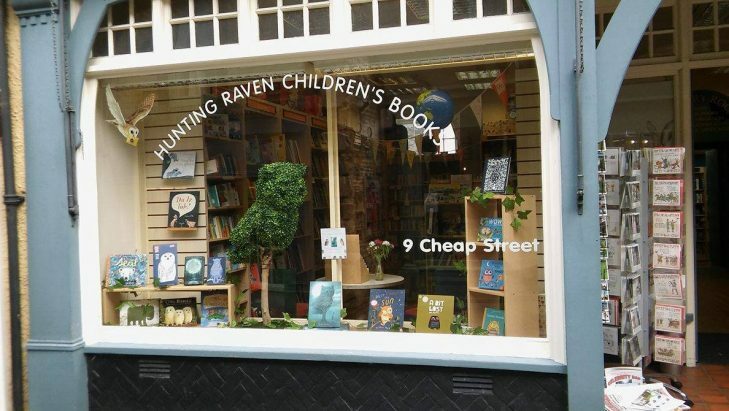 We were preening our feathers after being asked by Quarto Publishing to help them market this fantastic new addition to children’s literature. 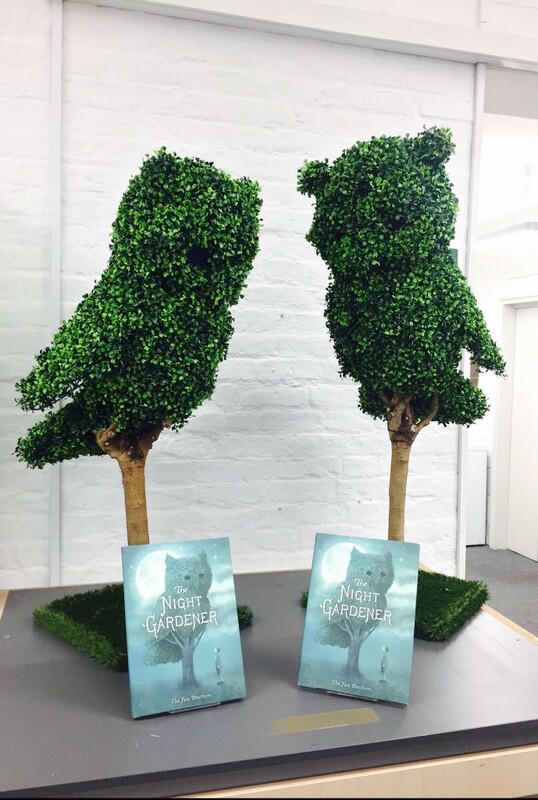 The book tells the story of a topiary expert who transforms a miserable and grey street into a place of joy and colour by completing amazing topiaries by night while the street’s residents sleep. 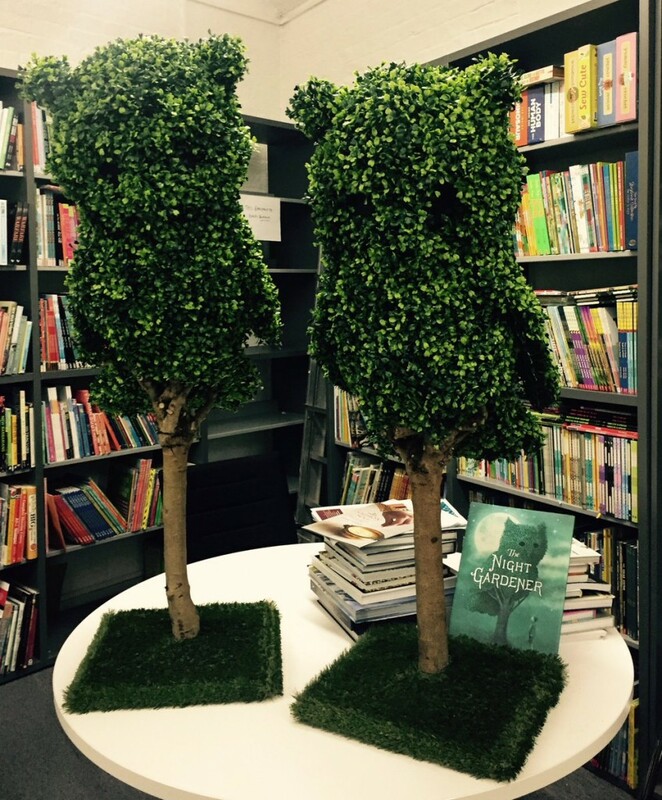 The book’s cover features a beautiful owl, which Agrumi’s own topiary expert deftly copied in artificial Boxwood. This material was chosen over living plants because the figures would feature in the window displays of various popular London bookshops from the hardback launch at the beginning of 2017 to the paperback launch extending into 2018. The figures would need little or no attention and would continue looking as good as the day they were made however long they were displayed and in however many different venues. Niche.co is an online platform providing resources to help advertisers grow their social presence across all networks. The company, which has been part of the Twitter family since 2015, works with top brands worldwide connecting them with social media celebrities and developing branded content. Planning to take part in ’Summer in the City 2017’ – the UK’s largest Youtube and online video festival – Niche came to Agrumi and London-based fine art photographer Linda Blacker for help with their own promotional needs. Linda has worked with a range of impressive clients and her unique style weaves fantasy and reality together to create eye-catching results. 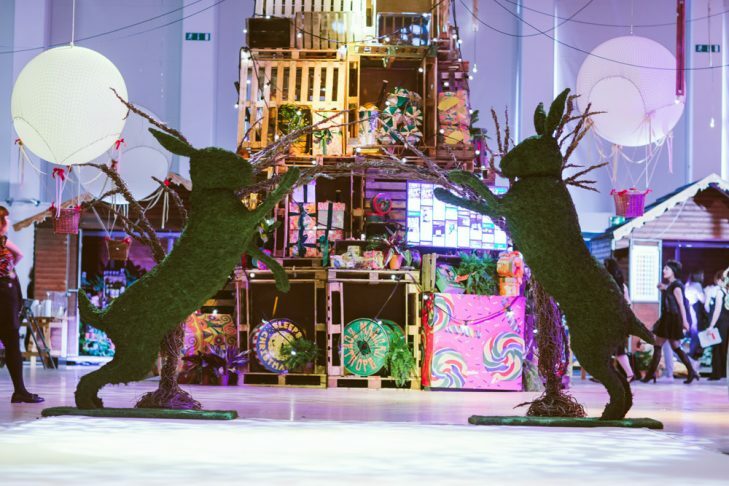 As creative director on the Niche project, Linda designed a stage set themed on the subject of ‘Enchanted Garden’. The result was delightfully evocative of Alice in Wonderland having been relocated to a Victorian fairground. Agumi’s role was to fabricate a giant copy of the Niche logo in moss to act as a focal point in the tableau. Constructed robustly on a wire frame, the logo was easy and light to manipulate into place and can be used again and again in Niche.co promotional events because the moss is dried and dyed a natural shade of green.